Composition 1 (referred to as “IPS50”) is a purely acrylate-based IPS formulation containing approximately 0.25% by weight of the fluoro-surfactant Y—X—CF2CF2O(CF2F2O)m(CF2O)nCF2CF2—X—Y, where X is a short linear urethane block copolymers chain and Y is a methacrylate group. Composition 3 (referred to as “IPS105”) is an acrylate/epoxide-hybrid IPS formulation containing approximately 1% by weight of the fluoro-surfactant Y2—X—CF2CF2O(CF2F2O)m(CF2O)nCF2CF2—X—Y2, where X is a long branched urethane block copolymers chain and Y is an acrylate group. Composition 4 (referred to as “IPS110”) is an acrylate/epoxide-hybrid IPS formulation containing approximately 0.8% by weight of the fluoro-surfactant Y2—X—CF2CF2O(CF2F2O)m(CF2O)nCF2CF2—X—Y2, where X is a long branched urethane block copolymers chain and Y is an acrylate group, 0.6% of the acrylic ester of Zonyl® FSO 100 by weight. Composition 5 (referred to as “IPS102”) is a purely acrylate-based IPS formulation containing approximately 1% by weight of the fluoro-surfactant Y2—X—CF2CF2O(CF2F2O)m(CF2O)nCF2CF2—X—Y2, where X is a long branched urethane block copolymers chain and Y is an acrylate group. 1. A process for providing a photocurable IPS material, applicable in a 2-step imprint method for the transferring of a pattern from an anti-sticking stamp to an IPS and the use of the patterned IPS as a template for the transferring of the pattern onto the surface of a substrate resist, comprising photoinitiators or catalysts with the ability to initiate polymerization, polymerizable mono- or multifunctional monomers and fluoro-surfactants completely or partly terminated by functional groups with the ability to covalently bind to the resist under curing. 2. The process of claim 1, wherein the concentration of perfluorinated fluoro-surfactants ranges from 0% to 30% and the said fluoro-surfactants are surface-active, implying that the concentration of fluoro-surfactants is significantly higher in proximity of the surface/interface region and that the material is characterized by low work of adhesion and not negligible interface energy. 3. The process of claim 1, wherein the non-cured IPS material contains polymerizable mono- or multifunctional acrylate-based monomers and at least one free radical photoinitiator. 4. The process of claim 1, wherein the non-cured IPS resist formulation is a hybrid, comprising polymerizable mono- or multifunctional acrylate monomers, polymerizable mono- or multifunctional epoxides and at least one free radical photoinitiators as well as at least one cationic photoinitiator, which upon photon-radiation forms a hybrid material comprising interpenetrating networks of polymerized acrylates and epoxides. 5. The process of claim 1, wherein the non-cured IPS resist formulation is a hybrid, comprising polymerizable mono- or multifunctional acrylate monomers, polymerizable mono- or multifunctional vinyl ethers and at least one free radical photoinitiators as well as at least one cationic photoinitiator, which upon photon-radiation forms a hybrid material comprising interpenetrating networks of both copolymerized acrylates and vinyl ethers as well as vinyl ethers. 6. The process of claim 1, wherein the fluoro-surfactants is a PFPE co-polymers with the structure Yp—X—CF2CF2O(CF2F2O)m(CF2O)nCF2CF2—X—Yp, where X is an aliphatic urethane block, Y is an acrylate or a methacrylate, m and n are integers, and p equals 1, 2 or 3, with a molecular weight of the PFPE part of the co-polymer of 800-2500 g/mol. 7. The process of claim 1, wherein X is an aliphatic copolymer block and the material is a hybrid comprising interpenetrating networks of acrylates and epoxides, or acrylates and vinyl ethers. 9. The process of claim 1, wherein the said fluoro-surfactant is Zonyl® FSO 100 or derivatives of Zonyl® FSO 100 covalently linked to the cured material. 10. The process of claim 1, wherein the work of adhesion of the IPS/substrate resist interface is smaller than 65 mJ/m2 (preferably smaller than 30 mJ/m2) and the interface energy of the polymer mold/replica interface is larger than 1 mJ/m2 (preferably larger than 4 mJ/m2). 11. The process of claim 1, wherein said molecules are used in Nano Imprint Lithography applications. 12. A process for providing a photocurable IPS material, applicable in a 2-step imprint method for the transferring of a pattern from a non-surface treated stamp to an IPS and the use of the patterned IPS as a template for the transferring of the pattern onto the surface of a substrate resist, comprising photoinitiators or catalysts with the ability to initiate polymerization, polymerizable mono- or multifunctional acrylates, epoxides or vinyls and siloxanes completely or partly terminated by acryloyl, epoxy or vinyl functionalities with the ability to covalently bind to the resist under curing. 13. 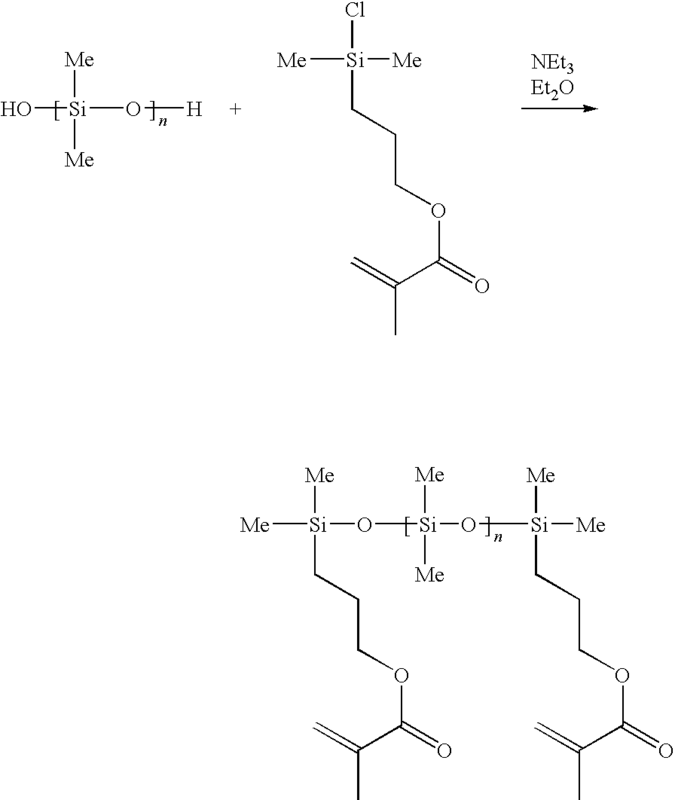 The process of claim 12, wherein the weight concentration of silicon containing molecules is higher than 40% and the work of adhesion of the IPS/substrate resist interface is smaller than 65 mJ/m2 (preferably smaller than 30 mJ/m2) and the interface energy of the polymer mold/replica interface is larger than 1 mJ/m2 (preferably larger than 4 mJ/m2). 14. A method of providing photcurable substrate resist, applicable in a 2-step imprint method for the transferring of a pattern from a stamp to an IPS and the use of the patterned IPS as a template for the transferring of the pattern onto the surface of a substrate resist, comprising photoinitiators or catalysts with the ability to initiate polymerization, polymerizable mono- or multifunctional monomers and derivatives of siloxanes and polydimethylsiloxanes completely or partly terminated by functional groups with the ability to covalently bind to the resist under curing. 15. The method of claim 14, wherein the non-cured substrate resist formulation contains polymerizable mono- or multifunctional (meth)acrylate-based monomers and at least one free radical photoinitiator. 16. The method of claim 14, wherein the non-cured substrate resist formulation is a hybrid, comprising polymerizable mono- or multifunctional (meth)acrylate monomers, polymerizable mono- or multifunctional epoxides and at least one free radical photoinitiators as well as at least one cationic photoinitiator, which upon photon-radiation formes a hybrid material comprising interpenetrating networks of polymerized (meth)acrylates and epoxides. 17. The method of claim 14, wherein the non-cured substrate resist formulation is a hybrid, comprising polymerizable mono- or multifunctional (meth)acrylate monomers, polymerizable mono- or multifunctional vinyl ethers and at least one free radical photoinitiators as well as at least one cationic photoinitiator, which upon photon-radiation forms a hybrid material comprising interpenetrating networks of both copolymerized (meth)acrylates and vinyl ethers as well as vinyl ethers. where n is an integer in a range of 1 to 20, R is an alkyl-, alkoxide- or tris(trimethylsilyl)- and R′ is a (meth)acrylate, epoxide or vinyl ether linked with the siloxane via a short alkyl group. 19. The method of claim 14, wherein said substrate resist are used in Nano Imprint Lithography applications.